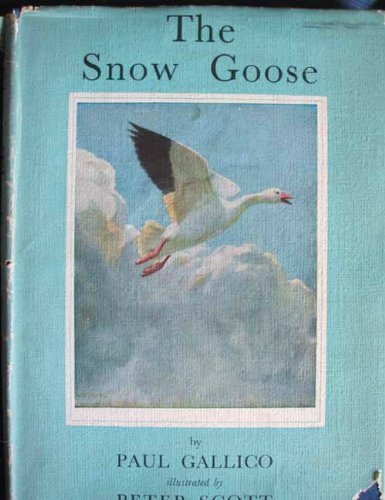 I’ve read quite a lot of books by Paul Gallico and I have a feeling that I read The Snow Goose a few decades ago, but when I saw this lovely edition of the book for sale at an antiques fair for all of £3 I decided it had to come home with me. It was first published in 1941, not long after the Dunkirk evacuation. It’s a very short tale, just 55 pages long but has some lovely illustrations by Peter Scott, the famous wildlife artist who was the son of Scott of the Antarctic. A lot of the illustrations are black and white woodblock prints but there are a few lovely coloured illustrations too. The story is about a lonely man who lives in an old lighthouse on the Essex coast, he has always felt like an outsider, someone who doesn’t fit in to ‘normal’ society. His problem is that he’s deformed, with a hunchback and also has a disfigured hand. It seems that people are unnerved by his appearance. But the sea birds aren’t judgemental and he forms a bond with a damaged snow goose which is brought to him by Frith a young girl from the nearest village. When Rhayader the man hears about the British army being stranded on the beaches around Dunkirk he decides to use his very small boat to sail over to France and manages to save a lot of lives by ferrying men on the beaches to the large ships standing off the beaches. This is a lovely but sad story, it feels like a fairy tale or maybe more closely a parable, and I can imagine it must have been very moving for people reading it when it was first published.